A view of a home in Afton. Afton Township was first settled about 1837 by Gaspare Bruce, a French Canadian voyageur from the Red River of the North, who made a claim of 160 acres near Bolles Creek. The next to arrive, in the fall of 1839, were New Englanders Joseph Haskell and James S. Norris. Joseph Haskell broke the land in the spring of 1840, and with a crop of corn and wheat became the first farmer in Afton. Another French-Canadian, Jean-Baptist Fournier, made a claim of 120 acres in 1841, as did Scot Alexander McHattie, who later moved to Woodbury. According to many historical accounts, Mrs. C. S. Getchel gave Afton its name. The landscape reminded her of Robert Burns’ poem, “Afton Water,” with its “neighboring hills, and the winding rills.” Afton’s first name, however, was Catfish Bar, alluding to a large sandbar in the St. Croix River that is still visible when water levels are low. In the days before bridges, or even ferryboats, Catfish Bar was a place where the river could be forded by cattle and horses. The earliest road from St. Paul passed by way of Bissell’s Mounds, a prominent landmark in Afton, to Catfish Bar, where travelers took to the St. Croix River to complete their journey. Afton’s first Swede, missionary Jacob Fahlstrom, settled on a farm near Valley Creek in 1841. He had traveled to America with a company of Hudson Bay Company men when he was fourteen, become a fur trader, and married a Chippewa woman. He was converted at the Kaposia Methodist Mission at “Little Crow” village in 1837 or 1838. In the winter of 1845-46 Lemuel Bolles built the first grist mill in the county on the creek that still bears his name. Milton Mills, as he called it, had a 9-foot wheel and a 50-barrel-a-day capacity, grinding mostly corn and wheat. Bolles and his family lived in a cabin by the mill. He became Afton’s first postmaster in 1852. In 1855 the village of Afton was platted by some of its earliest settlers on land formerly owned by Alexander McHattie. Over subsequent years other settlers moved into Afton and began to establish thriving businesses in what is now known as the “Historic Village.” These included the Emil Asp blacksmith shop, Charles Getchell’s grocery store, the Patterson and Cushing House hotels, Spreeman’s fish market, and Selma’s Ice Cream Parlor to name a few. There were also several churches established. The first school was organized in 1855 at the home of Joseph Haskell, and a school house was built the next year. The Boxell School, a private institution that emphasized horticulture, was organized by J. W. Boxell at about the same time. 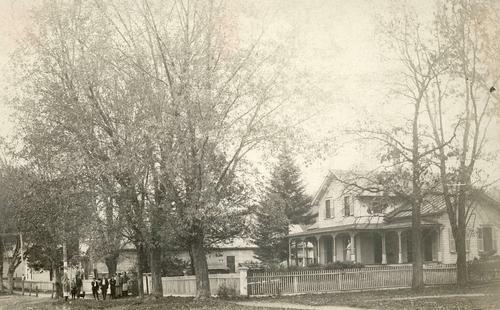 The St. Croix Academy, one of the state’s first high schools for boys and girls, was built in the village in 1868 and remained in operation until 1884. In that year, due to decreasing enrollment, the building was sold to the Evangelical Lutheran Joint Synod of Ohio, which founded and maintained a seminary there until 1893. In 1857 Erastus Bolles (uncle of Lemuel) improved the water power and built a blacksmith shop and machine shop on Bolles Creek in the village that came to be known as Valley Creek. His son C. E. Bolles built a corn and feed mill further down the creek, and in 1860 Gilbert and Buswell erected the North Star Flour Mill nearby. Valley Creek settlement acquired a post office in 1874. Another early settlement area was South Afton, located a mile south of Afton Village on Lake St. Croix. Originally a prime location for a sawmill, by the 1880s it boasted an elevator, general store, warehouses, and other buildings. J. P. Furber also operated a ferry across Lake St. Croix at this point. In the mid-1850s road builders completed the last section of the Point Douglas-St. Louis River road through Afton. It followed the course of Stagecoach Road, past the Joseph Haskell house and through Valley Creek. During the 1860-80s there was an influx of Germans and Swedes into Afton. The Germans liked the flat, fertile farmland, and the Swedes opted for the hillier regions near the rivers and streams—such as Swede Hill south of the historic village—that reminded them of their homelands. In 1971 the village and township were incorporated into the City of Afton. Afton has grown slowly and steadily, and in 2010 had about 2,886 residents.